Last summer, I posted about the construction of bus bulbs and other transit improvements along 45th Street. After a recent post about proposed changes to N. 40th Street, Wallyhood got an earful about the bus bulbs on 45th. So I thought it would be a good time to check in with Mr. SDOT, Jeff Bender, who explains all manner of transit and traffic improvements to the willing lay person. To recap, bus bulbs, or sidewalk extensions that allow buses to load and unload passengers without pulling out of traffic, were installed along 45th to try to improve the speed and predictability of buses on route 44. In recent years, 45th Street has seen a marked increase in traffic which has increased travel time for both cars and buses. One solution to this problem is to encourage more people to take the bus. However, people are reluctant to take the bus when it is always late. 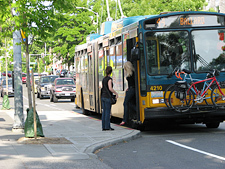 So, improving the reliability of the bus is an important step in increasing bus ridership. Bus bulbs are needed because even though the law directs cars to yield to buses when they signal to re-enter traffic, many drivers ignore the law and make it nearly impossible for the bus to pull back into the lane. Over the course of the bus’ route, this failure to follow the law leads to extensive delays. (It can also lead to a $124 ticket, FYI). “SDOT will measure the transit travel time savings for the Route 44 corridor once we have completed installing transit signal priority at selected signalized intersections. Prior to installing the bus bulbs in Wallingford for the Market/45th Street project, we estimated that the bulbs would generate a transit travel time savings in the range of 4 to 14 seconds per trip. While 7 to 16 seconds might not seem like much, over the course of the bus route those seconds add up. If you look at the chart below, you’ll see that more efficient loading and unloading shaves 4.5 to 8.7 minutes off the transit time from the bus’ point of origin to termination. Mr. Bender noted that he does not yet have data specific to Wallingford to support the above statement, which he made based on studies of other areas. However, later this year the transit signal priority (TSP) system, which gives buses their own signal, will be installed along the Market/45th Corridor. After installation, the vehicle wait times for cars and buses will be re-evaluated. After that: hard data. Because I was pretty sure that I wasn’t the only one confused by the new concrete islands in the center lane opposite the bus bulbs, I asked for clarification as to their purpose. The concrete barriers were, in fact, installed to increase pedestrian safety and decrease vehicular and vehicle/pedestrian accidents. The barriers prevent cars from pulling around the bus when it is stopped to let passengers disembark. As a bonus, they confuse people turning left. Just kidding. Wallyreaders should know that if the transit corridor improvements have caused unintended traffic consequences, you can contact SDOT to request an evaluation of the issue. SDOT has engineers in its Traffic Management Division whose primary job is investigating such matters. You can email Mr. Bender ([email protected]) or call 206-684-ROAD. I’m a fan of the bus bulbs and the overall changes. I’ve noticed the 44 is noticeably faster these days (the dedicated lane by Green Lake Way in particular has been a great addition) and the 16 also benefits when it is on 45th. I also feel safer as a pedestrian. I think a left-turn accommodation from westbound 45th to Wallingford makes a lot of sense as well – hope they’ll look at that. Agreed! Looking forward to the transit signal priority. That should be a big help. +Differences between Australia and the US: When I was in Melbourne in December, I biked past a tram that was stopped to let off passengers. At the next light, the tram driver got off and gave me a rather polite but firm lecture that all vehicles, bikes included, are obligated to stop behind trams, no exceptions, and that she had the authority (but was not exercising it) to fine me right then and there for failing to do so. Here, we have to put concrete down just to stop drivers from using the left turn lane as a passing lane when people are boarding and disembarking from buses, and individual drivers who think they are more important than the 60+ people on a bus and won’t yield to them, as they are clearly required to do. I think what they don’t take into account though is the increased traffic through residential streets, as impatient drivers get off 45th and speed down the other streets. I constantly am dealing with people practically mowing me down while trying to cross the street to my house. Where is that Yani? I find most of the side streets already have traffic calming measures in place. Are there actually people living in Wallingford complaining about this? Wow. Our neighborhood is in the middle of a city. Nobody living here or moving here should ever assume they will be able to have the same kind of mobility in a car that they would in, say, Redmond or any other suburb. If they want that, then Wallingford is not for them. As a neighborhood in the middle of a city we are dependent on transit, and anything that improves bus service – especially on the 44 route – is to be welcomed. Kimberly — thanks for the great article! the thing is junipero and CL.. many people mad ethi stheir home long ago.. and the density grows.. as do wquestionable moves by the city.. have you seen the extended no park zones now painted with red? Or been ticketed for being 2 inches over some mysterious new boundary? Or dislike those blue tower pay for parkign when it was free? Or called the Mayors office for info and had some one tell you to look it up on google? People didnt realize hwo dense things would become and how beaucratic the govt arms would become. Its a blog. we have a right to talk, and to question. Tho I see many full buses, I also some goby almost empty. I would reduce 44 service in middle of days if it were up to me and reinstate free parking in many places. I’d also reduce bus rates.. then I might take it. Dennis, I’m a pet sitter, so I’m all over the neighborhood, and I see cars speeding through all the time. I see people trying to drive down 45th who get impatient and make a quick hard unexpected turn to get off 45th all the time. Oh and yes, the islands they have to go around in the residential areas don’t make a difference to the impatient. I watched a huge pick up truck with an extended cab barely slow down for the island just last week. I was here way before the bus bulbs, and have definitely noticed the difference. I never made the connection before, but around the same time the bulbs went in, I have noticed a lot more people driving down Woodlawn’s one-way section going the wrong way, and always fast! The parked cars are at an angle, and I’m always worried someone’s going to pull out of a parking space and hit someone cruising down fast the wrong way. Also, are you willing to pay more taxes so that parking can be free? I would, in addition to providing us better parks, schools, health care, etc. I could be wrong, but I’m guessing you would stand against tax increases. So, please tell me — if parking is free, who is going to pay for improvements and maintenance of the streets that you park on? In the past, we gave our government more money and so free parking was a viable option. If you choose to shrink government, there will be consequences. Kimberly- Thanks for this follow up article on the bus bulbs. Forced swerves are as easy to maneuver as traffic circles, but you do have to slow down much more for bumps. However, if we (the city) are putting in bulbs to save money (via time), then it doesn’t seem to be working if we have to spend additional money for the consequences of the bulbs. No money saved, and a bunch of cranky people. Not much of a solution. I might have missed it, but have the various bus improvements through out the city increased ridership? I love 45th Street. It’s a much calmer and more pleasant environment than (ugh) 50th, which has really become an ugly, dirty, blight of a speeding roadway to me. My wish is to add a protected pedestrian island on 45th at Burke. My kids and I have almost been hit several times in that crosswalk due to people using the turn lane as a travel lane to get to the left turn at Wallingford Ave. That’s not what it’s for! One was such a close call I thought I would throw up from fear. So many kids and parents cross in that location for the Tae Kwon Do studio. I would love to see a safety buffer added. i am a substitute teacher. I make less than 15,000.00 . It is hard for me to support higher taxes. I have no medical insurance. I haven’t the income to support nicer parks, bus bulbs.. fancy patrol cars.. etc.. some day you may see me in front of QFC.. my landlord raised my rent 40.00 per month when I was told in December it would not be raised. I have deeply considered standing there with my “please help me” sign. The circles in the middle of the intersection that Seattle favors are less effective than mandatory turn crosses. If alternating mandatory right and mandatory left turn crosses were put along 47th except at the crossing arterials, you would not see the cut-throughs. True, this would make it a bit inconvenient for people in the blocks between 45th and 47th to go to 50th and vice-versa for those between 47th and 50th, but if the pattern were set up to be right turn west of left turn for each pair, people could always turn right onto 45th (for westbound) or 50th for eastbound.